So I have visited 86 Metro stations, and explored the surrounding areas, and in due time I will visit the five stops that recently opened up on the west side of the new Silver Line, for a total of 91 stations. There are Metro stations that have a half-dozen (or more!) museums within a one-mile radius, and there are Metro stations that have another Metro station located a few blocks away in every direction. At some Metro stations, you can ride the escalator into a neighborhood teeming with nightlife, or fast casual lunch restaurants, or murals, or classrooms, or offices, or some combination of the above. There are others where you are more likely to find boarded-up buildings or massive parking garages. Nevertheless, I set out with optimism that there is something interesting everywhere. In the middle of it all is Metro Center, the multi-line, multi-entrance station in downtown DC. You cannot go too far from Metro Center and still have Metro Center be the closest station to where you are. The blocks surrounding Metro Center have never seemed as hip as neighboring Galleryplace, where the busy, noisy, colorful 7th Street has museums and restaurants and bars and the Verizon Center, but there is plenty to see at Metro Center too. I have written before about Ford’s Theatre, which is a museum and a theater, as well as National Museum of Women in the Arts, where I have seen museum theater. Another site worth visiting near Metro Center is the Church of the Epiphany. It is not necessarily a museum, but it does have historical significant. Built in 1844, the Episcopal parish was attended by both Jefferson Davis (regularly; he rented a pew) and Abraham Lincoln (at least once, for a funeral). The building is on the National Register of Historic Places. With its Gothic Revival architecture and stained glass windows, it is also a place of simple artistic beauty. 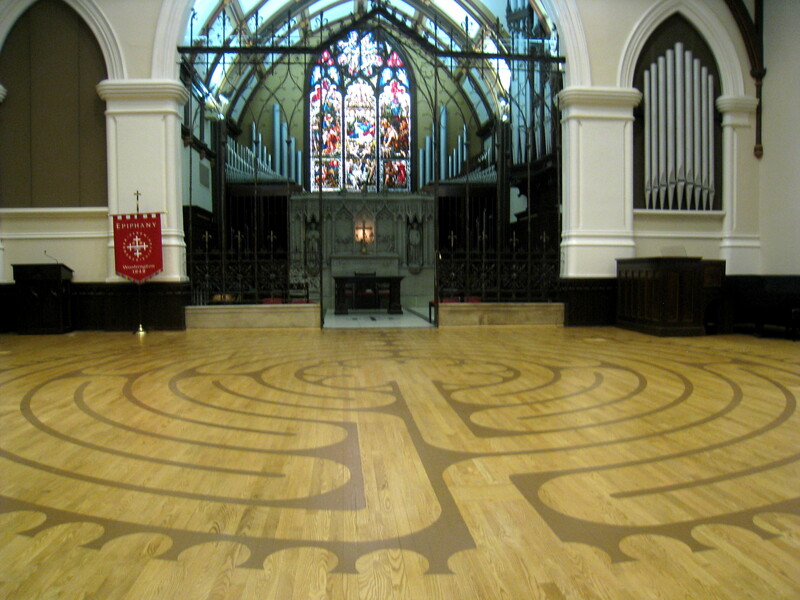 The reason for my occasional visits is the labyrinth. Labyrinths have been used around the world, through a good chunk of human history, for their healing and meditative effects. They can be found in a variety of places, including houses of worship, hospitals and other health-related sites, parks, and schools. A small number of other Metro stations also have public labyrinths nearby. A labyrinth is one thing, at least, that Metro Center has and Galleryplace (as far as I can tell) doesn’t. Metro Center is on the Red, Orange, Blue, and Silver lines. This entry was posted in WMATA and tagged Church of the Epiphany, DC, historic house of worship, historic site, labyrinths, Metro. Bookmark the permalink.